A “cloud on the horizon” means that something bad is about to happen. Meanwhile, someone with their “head in the clouds” is thoroughly out to lunch. As Gavin Pretor-Pinney points out in today’s talk, clouds get a bad rep when it comes to language. 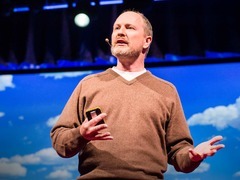 Pretor-Pinney is the founder of the Cloud Appreciation Society and, in this talk, he asks each of us to do something we excelled at when we were kids — looking up at the clouds and letting our imaginations run wild. He shows many evocative cloud formations — some created by specific, named types of clouds — and calls on us all to take part in this global Rorschach test. To that end, the Cloud Appreciation Society (which has 32,000+ members) last week released a CloudSpotter iPhone app that allows people to capture and share their own cloud images. Bonus: NASA will use anonymous data from the app to help calibrate its cloud-observing satellites. Below, Pretor-Pinney (and a few guests) shares a few cloud images with the TED Blog. A fish in the sky, spotted by Gavin Tobin of the Blasket Islands in Ireland. Spotted by Andrew Kirk of Deep Springs, California. A cloud in the shape of a UFO, spotted by Ron Biggs in Puerto de la Cruz in Spain. Spotted by Ron Engels over Central Brazil. Clouds, in wave form. Spotted by Laurine Ayers Briel in Maui, Hawaii. Another odd shape indeed, with bonus prismatic effect, seen by Danny McNeal of Sacramento, California. Some clouds that mimic mountains, over Mount Rainier, Washington, snapped by Ryan Verwest. A natural mushroom cloud, spotted by Mick Ohrberg in Kansas City, Missouri. A cloud waves goodbye, spotted by our own Katherine McCartney in Kenya. I’ve always been a gazer! The clouds seem as though they have something going on up there or a story to tell perhaps. The greatest achievement has been getting people who were not looking to finally see. Enjoy. I’ve always loved clouds. They give texture to the sky. I live in KC, so it was cool seeing a cloud from there. We get a lot of strange clouds, but I love seeing the different ones from around the world. Reblogueó esto en Compendio -No tan- Interesante. This has an interesting resonance with what we are doing in class right now. Check out these stunning images from TED Blog! Reblogged this on I am a Wanderer of Worlds.